Sweaty men with dreadlocks and hands full of beads beg for kisses from college girls, spitting on the sidewalk when turned away. A woman with an eyepatch howls from the top of a parade float while shaking her large bosom at the people on the sidewalk, who either look up in surprise or are too far gone to notice. The city-wide holiday didn’t previously require police to walk the streets of downtown Tampa or apartment boards to hire extra police officers to keep college students at bay, according to an email from Newport Town Homes Homeowners, Association, Inc.
Gasparilla started as a May Day festival in 1904 with a surprise invasion of pirates on horseback, said Lindsay Huban, museum relations coordinator of the Henry B. Plant Museum. The first Gasparilla party was held in Fletcher Lounge, which was once the library of the Tampa Bay Hotel. The pirate theme is based on the legend of the swash-buckling pirate named Jose “Gasparilla” Gaspar, who attacked merchant ships in the Tampa area in the late 1700s. Every year since 1904, a Gasparilla Court has been named, and the queen and king are showcased in the parade. 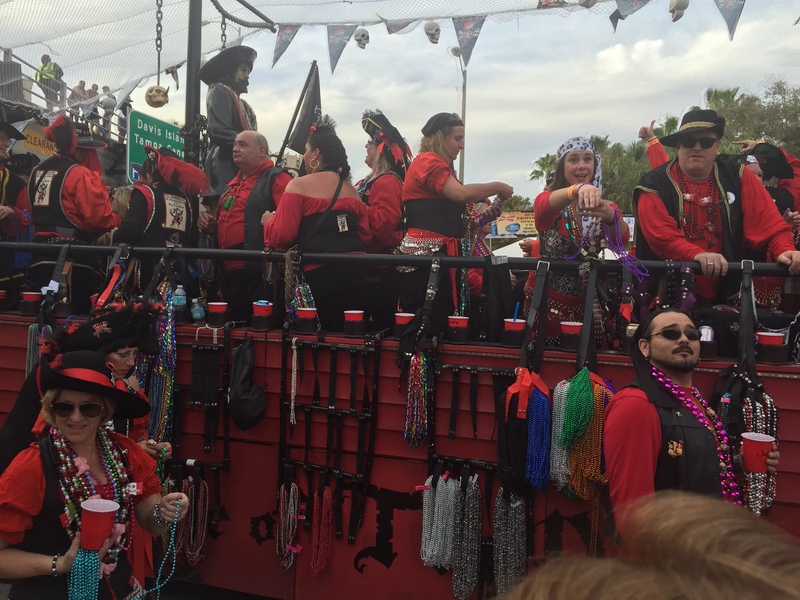 The court tradition is still kept today, although few similarities between the first Gasparilla and the modern festivities exist beyond that. The holiday has evolved into a weekend of parties, parades and plastic eyepatches. In 2016, there were 23 misdemeanor charges made on Gasparilla, including boating under the influence and underage drinking, according to patch.com. That’s a huge decline since 2010, when there were 413 arrests, most of which related to alcohol, according to the Tampa Bay Times. Between the crowds and the festivities, Gasparilla can get pretty intense if you’ve never celebrated it before. The parade route is about 3.8 miles long and contains floats, marching bands, and pirates throwing beaded necklaces and other giveaways. It begins at 2 p.m. on Saturday, Jan. 28 at the corner of Bay to Bay Boulevard and Bayshore Boulevard. Attendees can stand on the sidelines to watch or tickets can be purchased for those who want VIP seating. Visit gasparillapiratefest.com for more information about the parade. Sunscreen: Even if it’s just the little sample-sized tube a lady at the mall handed you, tuck it in your back pocket or drawstring bag – you’ll want it later. Weather.com predicts the low to be 53 degrees, but in years past, the temperature has been in the 80s, with that ever-persistent Florida sun we all love refusing to take a break. By the time graduation comes around, many UT students have gotten at least one sunburn during Gasparilla. Plus, consuming alcohol can actually worsen a sunburn because the body metabolizes alcohol into acetaldehyde, which can cause skin to be more sensitive to UV rays, according to prevention.com. Whether it’s chilling like a pirate at the pool or joining the masses at the parade, you’ll want to be able to enjoy your day without feeling the burn. Water: Walking through the streets on Gasparilla is like walking through the streets of Disney –with the addition of alcohol. The day is full of crowds, expensive food stands and lines. If you bring your own water, you’ll be a happy pirate sipping your drink on the sidelines of the parade, instead of waiting in a long line and shelling out $5 for a bottle of water. We all know it’s important to stay hydrated when drinking, so take advantage of the free water bottles the RAs give out. Everyone at the party will be envious when they see you walking around with a clean, cool bottle of water and they’re drinking out of a water fountain on the street. Reasonable footwear: “Definitely wear good shoes, because you’ll be walking everywhere,” said Zoe Lorusso, junior advertising and public relations major. That could mean combat boots or Converse, but high heels are not a good idea. Chances are you’ll be walking a couple miles during the course of the day. A GoPro: Gasparilla is the perfect time to capture life in Tampa and make all your friends back home jealous. Plus, you may need to take pictures (and Snapchats, of course) to remember your crazy pirate antics the next day. A lifeproof case is smart for any cell phone, as beer, liquor and unknown liquids are likely to catch some air at any party. Snacks: Most students leave their room early in the morning on Gasparilla and don’t return until the late afternoon, so slipping a granola bar into your drawstring bag can be a lifesaver. If you’re planning on buying something from a vendor, bring a small wad of cash just in case they don’t take cards (you’ll also avoid losing your credit card this way). Sunglasses: Putting a pair on your head or in your pocket can be a lifesaver, especially if you watch the parade for the full three and a half hours that it takes. Portable phone charger: There are no outlets conveniently built into the Bayshore sidewalk, so either prepare to put your phone on airplane mode for most of the day or bring a portable charger. “I usually bring a water bottle and a portable phone charger and my wallet just with a little cash, and my ID,” Williams said. Optional: A Fitbit – most people walk several miles on Gasparilla, so a Fitbit can come in handy if you’re in a competition for who has the most steps. “It’s really nice because you get to see how far you walked and it shows you how many calories you’re burning,” said Molly Silverberg, sophomore advertising and public relations major. “You can even do competitions between your friends on the app to see who walks the most.” Silverberg wore a Fitbit last year to Gasparilla and walked 3.3 miles. When it comes to safety, there are several things to remember: always stick with a buddy, be smart about how much you drink and keep your phone in a secure spot. Live Well UT will hold a Gasparilla Safety Fair on Friday, Jan. 27 from 3 to 5 p.m. outside of Morsani. There are also apps that students can download to help keep in contact with friends – Find My Friends and Life360 are both free in the App Store. Some people prefer to stay away from the crowds by watching pirate movies at home or relaxing by the pool with a bottle o’ rum – or, uh, lemonade. Either way, Gasparilla is the perfect opportunity to let out your inner pirate.